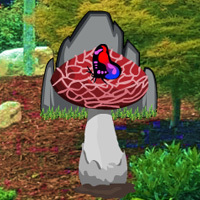 Wow Horticulture Forest Escape is another point & click escape game developed by WowEscape. In this game, you came to see the beauty of a horticulture forest. But unfortunately, you missed the way out from that place. You have to find the way to escape by finding useful objects, hints and by solving puzzles. Click on the objects to interact with and solve puzzles. Good luck and have fun! Is it me, or has anyone else noticed that when you go into a WOW or G2R game, click on an inventory item or a puzzle, the game jumps around from one scene to another by itself? That's been happening lately, like in the last week or 2, but just in the beginning of the game though. If you restart the game, it's OK after that. Rock for mushrooms in scene above that one. Pour gold pot on 4x5 dot grid in scene where you place 4 butterflies. Orange container with blue liquid used twice in 1st set, then disappears from inventory. Sugarcrush, I believe that is a problem with flash not loading properly. I've experienced it on and off for several years. Partial solutions are to clear your cache and to hard reload (which should do the same thing). Sometimes takes several tries. Stuck with lady bug and red flower. Also a pineapple looking plant on the ground in scene w/four pink tulips (lower right) that I cannot pick-up. Thanks Anita. I clear the cache throughout the day. I'll deal with the game reloading, since the problem only happens almost as soon as I enter the game and click on something, so nothing really is lost. Only happens with G2R and WOW games and not with other developers. Otherwise, flash works fine here. Sneaky axe in scene where you place 4 flower bulbs (2nd set). Stuck in second set with a hammer (used once already I think), a red flower and a lady bird. Need last lemon, a clue for the green/pink/blue dot puzzle, 6 more pears, and a green and cream bud. Hmmm, must be missing something obvious as usual! Also in same scene with 4 pink tulips are three sneaky arrows ( 2 pointing up and one down) just above indicator to move up. Do not know where the arrow hint is used yet. @ soulessminion... use hammer on middle rock of sidewalk in scene where you place red peppers for the green, pink and blue puzzle. I am also stuck with ladybug and red flower. Very sorry but I cannot remember atm where the lemons and cream green bud came from. Also need lots more pears. Red flowers are collected (3rd set). Out! Good game, thanks WOW. Checked the walkthrough... I would never have got it from the clue! It is at around 7 mins, for those who don't get it either. The 1/2 puzzle was the hardest for me. Use the arrow clue on one column 1/2 at a time. First, arrow up = move a number up. That could only be the 2 since the 1 is already on top at first. Then, move a number down (arrow down). It could be the 2 going back down, but that would be silly, so move the 1 to the bottom. Then, arrow up again... the number 2 moves all the way to the top. Repeat for the other columns. At the end all 1's should be at the bottom and all 2's on the top. Eureka, I think you overthought the 1/2 clue. I read it as "2 up, 1 down" so 2's on top, 1's on bottom. I'm currently stuck with 6 of he last yellow fruit, can't find 7th.